Following a successful visit to the Gloucestershire Warwickshire Railway at the end of May, West Country Pacific 34092 ‘Wells’ has been prevented from returning home at present by road access problems at Ingrow. Having been at Toddington for just over a month, ‘Wells’ travelled by road last week from the Gloucestershire Warwickshire Railway to the East Lancs Railway at Bury, where it is likely to remain until late August. It will be running on the ELR on at least 10 days during that period. 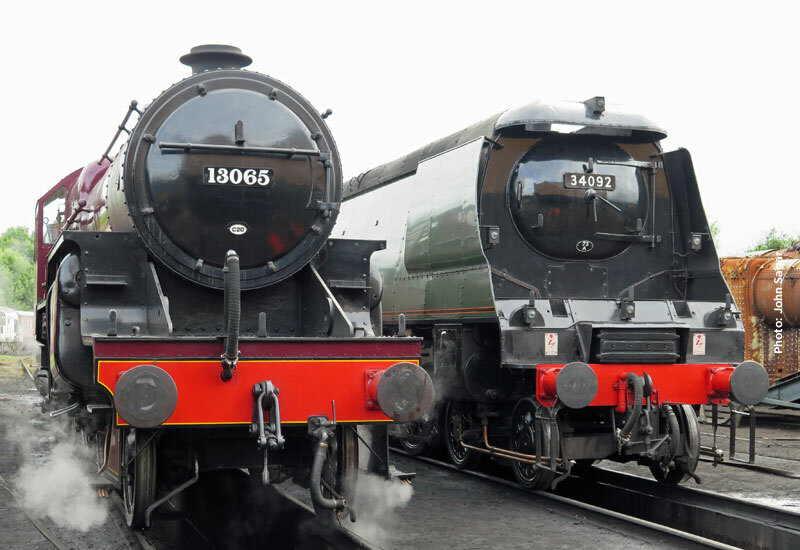 The first running days are Wednesday 22nd, Thursday 23rd, Saturday 25th and Sunday 26th July, but Members are advised to consult the ELR website for further details. The photograph is of 34092 on its first steaming at Bury on Monday afternoon with resident LMS ‘Crab’ 2-6-0 13065, whose restoration of course started at Ingrow on the KWVR many moons ago.